Barone’s interest in organ music began in his teens, at first listening to recordings then playing at his hometown church in Kingston, Pennsylvania. He attended Oberlin College, worked at the student-run WOBC-FM radio station, and graduated from Oberlin Conservatory in 1968. 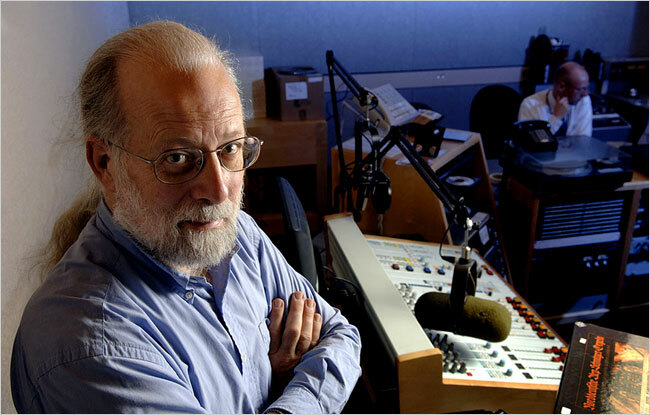 He began his professional radio career as the music director of KSJR-FM located at St. John’s University in Collegeville, Minnesota which evolved into Minnesota Public Radio, where he served as classical music director for 25 years. Photo: NYTimes: Michael Barone at the St. Paul studio that produces his ‘Pipedreams’ program. As host and senior executive producer of Pipedreams, he is recognized nationally for his outstanding contributions to the world of organ music. Pipedreams began in 1982, and it remains the only nationally distributed weekly radio program exploring the art of the pipe organ. Michael’s talent and commitment have been recognized with numerous awards, including the American Guild of Organists President’s Award in 1996, the Distinguished Service Award of the Organ Historical Society in 1997 and the 2001 ASCAP-Deems Taylor Award. In November 2002 he was selected for induction to the Minnesota Music Hall of Fame.. You can listen to the Pipedreams audio at www.yourclassical.org. Dinner – $30 per person if reserved and paid by Memorial Day + Cash Wine Bar. After Memorial Day, dinner – $34 per person + Cash Wine Bar. Seating is limited – AGO Members and guests will have priority reservations. Reservations by members of the general public accepted subject to space. There are two parts to the reservation process: 1) completing the form to tell the AGO if you wish to order vegetarian meals; 2) paying for the reservations, either by mailed check to the treasurer (please make checks out to Albuquerque Chapter AGO), or via PayPal, whether by credit card or through your own PayPal account. PayPal – click on card graphic below to be taken to the PayPal website. If you do NOT have a PayPal account, select “Checkout” on the PayPal website, and use your credit card in the Guest Checkout process. PayPal also accepts payment from linked bank accounts if you have a PayPal account. Reservation Form for those wishing to order vegetarian meals. If paying by mailed check, please complete this form which will go direct to the treasurer. If using PayPal, please also use this form to order a vegetarian meal (not necessary otherwise).